This has been an extremely unpredictable year with respect to rain and snow, which in California is very predictable and reminds us all about the inherent variability in California’s precipitation. Fortunately, water resources managers in Northern California understand the region, they have learned from the past and they are well prepared for this water year. In sum, flooding has been minimal this year and as we head into the critical part of the water supply year, reservoirs in Northern California are full and groundwater aquifers have been stabilized and recharged after previous dry years. Most importantly, Northern California water resources managers this year are able to do what they do best–serve water for multiple beneficial uses in the region: cities and rural communities, farms, fish, birds, and recreation. Precipitation levels are shown in the chart below, which shows the wide variability this year. The year appears to be a below-normal year under the Sacramento Valley index. 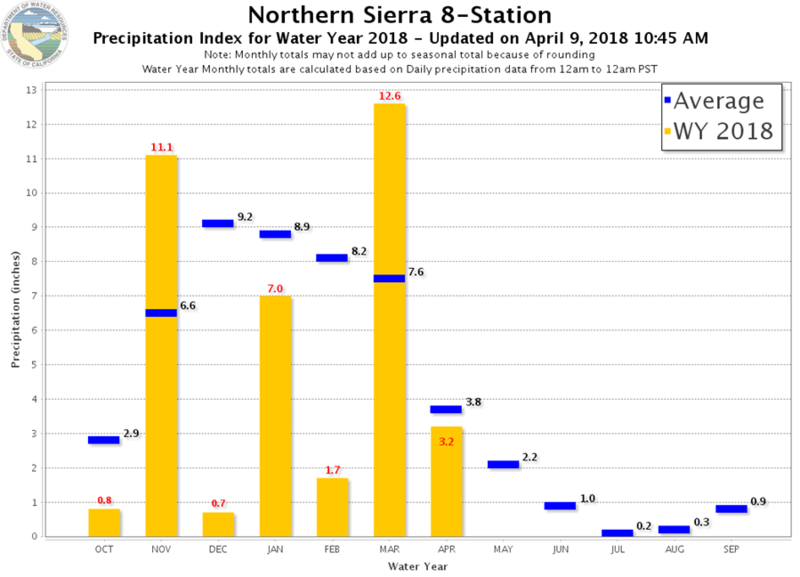 For the snow survey on April 2, electronic measurements indicate the snow water equivalent of the northern Sierra snowpack is 56% of average for April 1 in the Sacramento Valley. More storms are on the way. Reservoir levels in Northern California are essentially full following several wet years and a wet spring, with Central Valley Project reservoirs more than 80% of capacity and storage levels at 107% of historical average at Shasta and 121% at Folsom. On the State Water Project, Oroville is at 80% of historical average, as the Department of Water Resources (DWR) has done a nice job managing the reservoir to repair the spillways while maximizing the ability to deliver water this year. Local reservoirs are also in good shape. Reservoir levels can be seen through CDEC. Groundwater levels in Northern California are sound and have generally recovered to pre-drought levels, with local agencies watching a couple of pockets that have not fully recovered. The recent NCWA blog series by counties and local agencies has painted a localized picture of groundwater levels in the ten counties on the Sacramento Valley floor. The Groundwater Sustainability Agencies (GSAs) are also working to improve groundwater conditions as part of Groundwater Sustainability Plans (GSPs) by 2022, with a focus on recharge opportunities and other ways to assure sustainable groundwater levels in the region. See Fact Sheet: Sacramento Valley Groundwater. It should be noted that water resource managers’ preparation for this year did not happen casually or by accident, with thoughtful and careful planning for many years. This has included the development of various types of infrastructure necessary to address this wide variability in weather and water years and to provide flood protection and support these multiple beneficial uses of water. 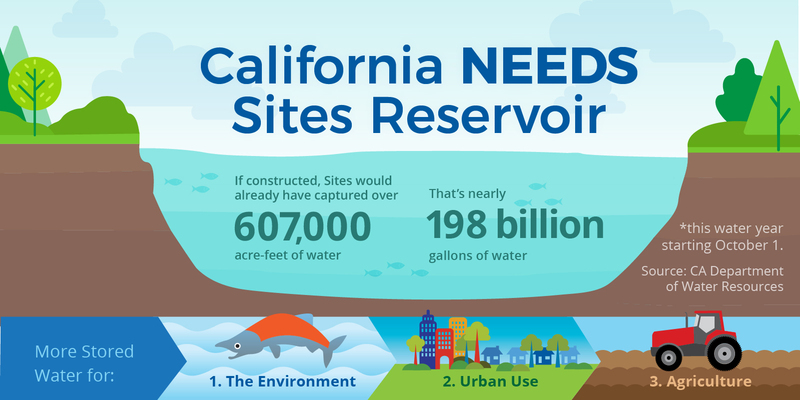 If the proposed Sites Reservoir were online, it could provide benefits this year and every year by helping California prepare for this variability. After several wet years in Northern California, Sites Reservoir would be nearly full and the water could be used for various public benefits and meeting beneficial uses throughout the state. This year Sites could have stored more than 500,000 acre-feet, which is half the capacity of Folsom Reservoir. In sum, Sites Reservoir would provide public benefits and has strong statewide support.